NAMM 2017: Given the performance of Paul Brett's last 12-string - the compact Vintage Viator - we're pleased to see a bigger-bodied model given the green light, the Vintage Statesboro'. Paying tribute to the pioneering blues era of the 1930s and Blind Willie McTell in particular, the Statesboro' acoustic guitar offers a solid spruce top with maple back and mahogany sides paired with a mahogany neck, plus bone saddle and nut. 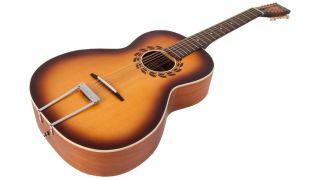 The model is available in both acoustic and electro-acoustic guises, with the latter boasting a Fishman Rare Earth humbucker soundhole pickup system. "Using the designs of the legendary Stella guitars crafted by Oscar Schmidt in the early 20th century, Vintage and I have created an homage to the iconic model that Willie himself played," says Paul. "Obviously, we have updated various elements to morph into todays market, but in essence, it looks like and certainly sounds like a big blues machine of that era." Sounds good to us. The Vintage Paul Brett Statesboro' 12-string is available now for £549 (acoustic) and £749 (electro-acoustic), both of which come with a Kinsman hardshell case.